Here is a brief description of the food preservation methods detailed in the book The Home Preserving Bible. Canning, freezing, and drying food are the most common methods for preserving foods at home today. However, there are many other methods, and some are easier and less expensive. Listed below is an overview of 10 methods for preserving foods, including today’s popular methods, as well as other old-fashioned and ancient techniques that are worth re-visiting. Canning is the process of heating the product at a specified temperature for a specific length of time (pasteurizing), and then vacuum sealing the pasteurized food in special glass jars designed for this purpose. It can be used with most foods, including fruits, vegetables, meats, seafood, and some prepared foods. Canning requires the purchase of reusable canning jars and rings, one-time use sealing lids, and some practice to learn the necessary and detailed steps. For more information, read: How to get started with the canning preservation method. Freezing is the process of chilling foods to at least 0°F. It can be used with all foods, including fruits, vegetables, meats, seafood, grains, nuts, dairy, eggs, and prepared foods. True freezing is not possible in the freezer compartment of your refrigerator where the temperature is typically much warmer, between 10°F to 32°F. Freezing is easy to do, if you can afford to buy and operate the relatively expensive appliance. For more information, read: A short primer on freezing food. Drying is the process of dehydrating foods until there is not enough moisture to support microbial activity. It can be used with most foods, including fruits, vegetables, meats, seafood, grains, legumes, and nuts. There are several different techniques, some are relatively easy to do and require no special equipment. For more information, read: An Introduction to the Drying Food Preservation Method. Fermenting is the process of encouraging the growth of “good bugs” to inhibit the “bad bugs” that can spoil food. It can be used with many types of foods, including fruits, vegetables, meats, seafood, grains, legumes, dairy, and eggs to produce a wide range of products such as wine (from grapes), sauerkraut (cabbage), cured sausage (meat), and yogurt (milk). Many fermented products can be produced without any special equipment. The method for each type of product is relatively easy, but requires attention to detail. For information on some of these methods, read: more articles about Fermenting Foods on this website. Pickling is the process of soaking food in a solution containing salt, acid, or alcohol. It can be used with most foods, including fruits, vegetables, meats, seafood, legumes, and eggs. Most methods require no special equipment. However, pickled foods can be unsafe if prepared carelessly or stored at room temperature. Pickling is often combined with another method, such as fermenting, canning, or just refrigerating. Here are some simple techniques to get you started: 10 refreshing, easy pickling recipes. Dry salting is either a fermenting or pickling technique used for meat, fish, and vegetables. A low salt concentration (2½% to 5% weight of the salt per weight of the food), promotes fermentation, while a high salt concentration (20% to 25% salt), prevents microbial growth and preserves the food in a more or less fresh, although salty state. Many people familiar with the technique consider salted vegetables such as green beans to be far superior in taste and texture than canned or frozen beans. This old-fashioned method was promoted in the early twentieth century as an alternative to canning, in order to conserve glass, tin, and fuel in time of war. Here is a recipe for salted cauliflower that you can adapt to other vegetables: Salted cauliflower, peas, or green beans in brine without fermenting. Curing is similar to pickling, and uses salt, acid, and/or nitrites. It is used for meat and fish. Simple, modern curing methods often reduce the amount of salt and nitrites, which may require that you refrigerate or freeze the final product. Shelf-stable products require the use of adequate amounts of nitrites and a complex drying process using special equipment and exacting technique. Some curing methods also employ a secondary process such as fermenting, smoking, or sealing. For more information, read: All about brining and curing corned beef and game meat. Smoking is a complementary process to curing that improves flavor and appearance, and can also act as a drying agent. Smoking in the home environment contributes more flavor and appearance benefits than food preservation. However, smoked meats are less likely to turn rancid or grow mold than unsmoked meats. Sealing is a process of covering food to keep out air, which delays (but does not stop) the activity of spoilage organisms. It is used primarily as a complementary process to other methods such as drying or freezing. Both fat sealing and vacuum sealing methods are relatively easy. Vacuum sealing a relatively inexpensive small appliance. Cellaring is the process of storing foods in a temperature-, humidity-, and light-controlled environment. It can be used with many foods, especially vegetables, grains, and nuts, as well as fermented foods and dry-cured meats. There are many different methods for cellaring food, all of which are relatively easy to do. Some require simple, inexpensive equipment you may already own. No matter where you live, whether in an apartment or on a farm, you can use the concept of cellaring to some degree. For more information, read: Winter food storage guide in a root cellar or other cellaring methods. 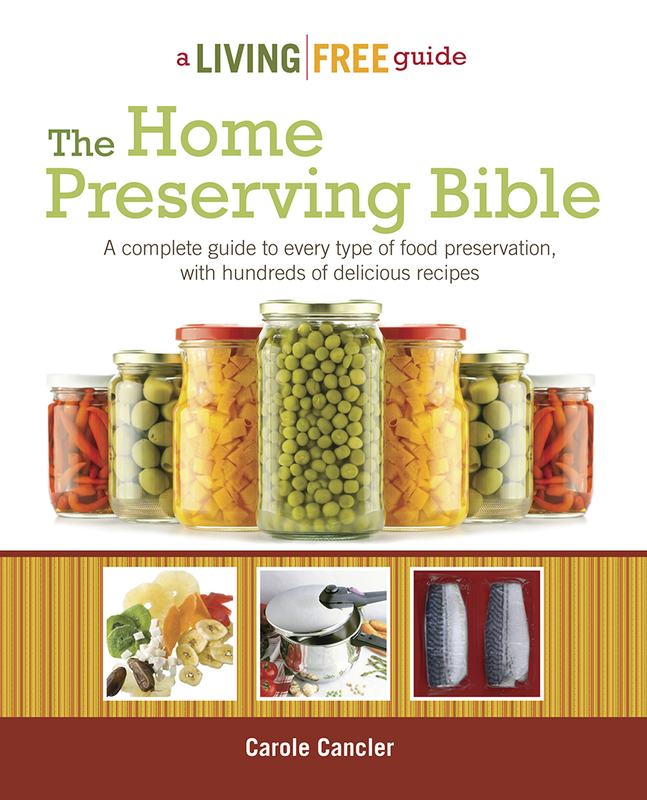 For complete details on these food preservation methods, with over 300 recipes, see the book The Home Preserving Bible by Carole Cancler, available from booksellers everywhere. need to know how to freeze cherries please. Wash cherries in a large bowl or basin of clean water. You leave cherries whole, pit them, or cut them in half. Pitted cherries offer the most flexibility for use. Pit cherries using a hairpin or paper clip (opened up into an S shape); some pits are easier to extract than others! You can also purchase a cherry- or olive-pitting tool at any kitchen supply outlet. Pack into freezer-safe containers with or without sugar. Sugar protects the color and flavor of fruit during storage. To use sugar, sprinkle pitted cherry halves with sugar and allowed to stand 30 minutes in the refrigerator, or until syrup forms. Alternatively, you can immerse the prepared cherries in unsweetened liquid such as water or apple juice, or in a sugar syrup. Pack into zipper-style freezer bags or plastic containers. Be sure to remove all air in bags before sealing. In containers, leave 1/2 to 1-inch headspace, but press plastic wrap or parchment paper over the fruit to keep from air. If you have light colored (golden cherries), you may wish to treat them for browning after you pit or cut them, but before freezing. Either soak them in ascorbic acid (Vitamin C) solution or steam them. For example, crush six 500-milligram Vitamin C tablets and stir until dissolved. (Be sure to use plain ascorbic acid, not time release or with any other ingredients.) Allow cherries to soak 5 minutes, drain well, and pat dry. To steam blanch, bring water to a boil in a pot or wok fitted with a steamer rack, add the cherries in a single layer, cover, and steam for 30-60 seconds.